I haven't felt much like posting this past week. I miss Neal terribly and hope that we made the right decision with him. It is very hard even if you believe you are ending their suffering. I just really have stayed depressed about him. We had decided that once we were "dogless" we would stay that way for awhile. As you know, Terry has some health challenges and it isn't easy dealing with pets when you have to spend time in hospitals or doctor's offices. And we are hoping to do an Alaska trip in the next couple of years, so it would be easier to wait until after that to add another pet. So right now I am fussing over all the dogs in the campground. They are doing well with allowing me to love on them, so that helps. Last week we had doctor's appointments for Terry in Indy. These were with his two cardiologists, the one being his EP doctor (electro-physiologist, aka defibrillator dude). All went well and they are very pleased with how he is feeling after his bout with heart failure two weeks ago. We were all surprised to learn that the local doctor had filled Terry's chart with "non-existent symptoms." Our doctor questioned him at length about these symptoms and these are things he/we NEVER reported to any doctor and it soon became apparent what happened. I told our doctor that I now believe that these notations were placed in Terry's chart in order to justify running a bunch of unnecessary tests. Unfortunately that might be true. We know a little more about how to deal with ambitious people now, so hopefully that won't happen again. The EP doctor did tell Terry that he wanted him to get a new ICD. . . one with multiple (up to 3) leads. These new ones are particularly helpful in people who have experienced heart failure and they have been shown to improve overall heart function. So, we will be heading back to Indy the end of this week and they will implant a new device. We have scheduled it between our RV rallies, so that is good. Having had this procedure before, we don't anticipate any ill effects from it and are anxious to put it behind us. The other item of note is that Terry was chosen to be featured in the hospital's new brochure on ICD's. They had called prior to our visit last week and asked if he would be willing to participate in this. It is a brochure distributed to doctors and they are interested in how life has been living with a defibrillator. I call this "better living through technology." Hah. So our appointment was much longer than usual because photographers and interviewers were in the room with us and asking questions and taking pictures as the day progressed. Then when we were finished with the doctors, we went down to the rose garden for another photo op. They have promised us a CD with all the pictures and are to send us the brochures they create. Yesterday was our 39th wedding anniversary. It just so happened that our son had flown into Indianapolis for t he MotoGP races this weekend and we met him and his cousin in Kokomo in the afternoon for dinner. We took Mom and Dad because they hadn't seen Brandon in about a year. Also my sister and niece went along as well. It was a great time and it was good to see Brandon again. Today is his 29th birthday. Happy Birthday Son! It just doesn't seem possible. We are now at Elkhart Campground awaiting the Gypsy Journal rally which starts tomorrow. We have some errands to run early tomorrow and have to check on our last apartment which is now vacant and see what we have to do in order to move the new tenant in. It will be great to have them all rented again! Then it is time to relax and enjoy the company of others who have gathered for this rally. The campground is full to capacity with no room to spare. What a great time we will have! Neal came to live with us when he was six years old. 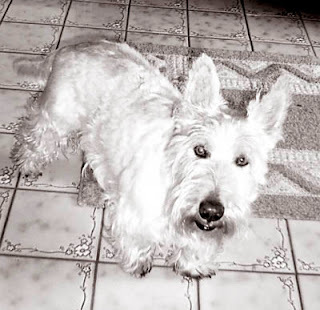 He was a rescue Scottie who needed a home and we needed another dog to share the yard with Bailey. 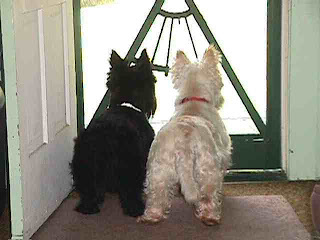 Bailey was a black Scottie and Neal was a wheaten or white Scottie. Together they made quite the pair. We were told Neal had a condition known as Scottie Cramp, but it soon became obvious that this condition Neal displayed was not episodic but a chronic neurological disorder. It happened that there was a newly discovered (but very old) disorder in Scotties called cerebellar abiotrophy or CA for short. I took Neal to a vet who was a Scottie breeder and she, along with researchers at Tufts who reviewed her findings and studied videos of Neal, diagnosed him with this insidious brain disorder. It causes a particular cell in the cerebellum to die off and that cell controls voluntary muscles, so we knew that eventually Neal would lose his ability to walk. Neal was enrolled in a research study for this disorder at North Carolina State University. This disorder affects people as well and the data gathered from the dogs in the study is being used to develop a blood test for genetic testing in humans. Throughout his life with us, Neal rolled with the punches. He never complained about his lot in life and our vet said it is likely he didn't know anything was wrong with him. His condition caused no pain but he spent a lot of time rolling and tumbling. He and Bailey lived in harmony; Neal always looking to Bailey for what to do and how to do it. Bailey tolerated clumsy Neal and we know he was glad for the company. A year and a half ago Bailey developed congestive heart failure and though we treated it aggressively, he died within two months. Neal was devastated and we thought we might lose Neal as well. He had anxiety attacks and looked everywhere for his friend. It was heartbreaking. Eventually Neal came to accept that he was alone with us, but it seems the spark had gone from his eye and he became a sporadic eater. He developed a number of physical ailments that we treated. He was a seizure dog and had to be on phenobarbitol and potassium bromide for several years. Even though his seizures ceased and we were able to take him off these medications, they had damaged his liver and kidneys and we knew eventually he would suffer. This week has been particularly bad for him for some reason. Something happened the other night and I think he may have had a stroke. He exhibited odd behavior and from that point on refused to eat. I tried to interest him in several different foods and tried to hand feed him, but nothing worked. He started drinking large quantities of water. He was having difficult even sitting up. He would be in a seated position and fall over. The mobility problems he normally had were compounded and there were times he would stare vacantly around. I decided to take him to the vet this morning because it is Friday and I couldn't bear the thought of his not eating all weekend and literally starving to death. He has already lost five pounds since April and he had no fat or muscle mass in his back and hindquarters. We had his past two blood profiles to compare and the vet did another blood draw. We waited for the results. They were not good. His liver numbers were off the chart, as they have been for several months. But the kidneys were way up and the two things together do not make for a comfortable life. She said he was likely nauseous from the liver problems and not eating because he didn't feel good. She said he was dehydrated somewhat and might benefit from hospitalization with IV fluids. I cannot do that to Neal. He would not have wanted that. She volunteered to give us some other foods to try, but she said we would just be giving ourselves a few days to say goodbye. We decided to end his suffering right then. I hope we made the right decision. I pray that he is with Bailey and running and chasing butterflies--his all-time favorite activity. When we get his ashes back, we will take them to their vet in New Castle and have his ashes scattered where Bailey's were scattered so they will forever be together. It sure it good to be home. . . in Phaeton Place. We got home from the hospital on Thursday and Friday we brought the motorhome over to the Elkhart Campground, where we will stay for the next month. We spent the rest of the day here before going back to the condo. We thought with the oppressive heat, we would stay over there to guarantee Terry would be comfortable. Saturday we signed a lease on one of our apartments (YAY!) and got ready to head down to my sister's. We had tickets to go see Herman's Hermits at the Honeywell Center in Wabash. When Terry ended up in the hospital, I told Nita to find someone else to use the tickets, but she wasn't able to. As it turned out, Terry felt well enough to go, so we drove down to their house last evening. They live in the country near Claypool and it is about an hour's drive from here. Once there, we dropped Neal off at Mom and Dad's. They have been watching him periodically and they seem to enjoy each other's company, so it worked well for us. We went early enough that we could go out for dinner, so Mom and Dad, my sister and her husband, and Terry and I went to Ruby Tuesday's. You surely know that anyone on a salt restricted diet like Terry cannot eat most places, but the salad bar at Tuesday's features lots of fresh veggies and that is what we had. It was delicious and great to be with family. Afterwards, Jim and Nita drove us down to the concert. It started promptly at 7:30 and we thoroughly enjoyed the show. Peter Noone (a.k.a. Herman) puts on a really good show. The band is entertaining and very talented. He sang the Hermits' hits as well as other songs from the sixties. We had a great time and really enjoyed the show. It was relaxing and we had super great box seats. I would return to that venue for another show. When we got back to Mom and Dad's, we picked up Neal and drove back to Goshen. It was around 11 p.m. when we got back and we were pretty tired. Today we got back "home" to the motorhome and will be staying here nights and working at the apartments during the day. We have a repair on our bedroom slide in another week and I had to empty everything from under the bed. It is all back at the condo and I have to go through it because I am sure I don't need everything that was there. We are home now and Terry is resting. It's been a wild week for us. The picture is the Indianapolis skyline taken from the 5th floor of Methodist Hospital where Terry and I are spending the night in the Advanced Heart Care wing. The good news is that we should be released from here tomorrow. It all started at midnight Saturday when Terry started coughing. He couldn't seem to stop and then he started having shortness of breath. He wouldn't let me take him to the hospital, but when I got up at 3 a.m., I didn't give him a choice. We drove over to the Elkhart Hospital and he was taken into the ER. He was experiencing congestive heart failure--something we and his doctors have always been alert to and watched for. Key factors for preventing attacks include monitoring fluid intake and a low sodium diet. Within a couple hours, Terry was feeling much better and the ER doctor said he would be dismissed later in the afternoon. Well, that was before the cardiologist saw him. They admitted him to the cardiac floor and Sunday, Monday and Tuesday he ran tests. Interestingly enough, he didn't find anything wrong, but insisted that he then have a heart cath. Terry told him he would not have one there, he wanted to go to Indianapolis. It makes sense that since we are just three hours away, he wanted to be with his own doctors who have treated his heart condition since 1998. Eventually we prevailed and today they took Terry by ambulance to Methodist Hospital. He was cathed at 5:15 and they were done in record time. He has no blockages, his arteries are clear and clean and his 12 year old stents are in great shape. There is good pulmonary function and the problems he has experienced with fluid will be treated with medication. Let me hear a BIG WAAAH HOOO! We are relieved. While our doctors here did not believe a cath was indicated based on the tests he had in Elkhart, they agreed that after twelve years, it wouldn't be a bad idea. The same doctor who cathed him 12 years ago did the procedure today. A much different result. That cath lasted over 4 hours and he nearly died, but today's was about 30 minutes. Terry's EP doctor is talking about a new ICD for Terry--one that improves heart function in people with complicated problems, but that will be another time. So for the present, all is well and we should be back home to Phaeton Place tomorrow. Back in the land of hot and muggy! We arrived in Shipshewana Sunday afternoon and set up camp. Nothing in Shipshewana is open on Sunday and we had a relaxing time sitting out and chatting with other earlybirds here for the flea market. Monday is not a flea market day, that would be Tuesday and Wednesday, so we took the day to visit some of the other shops around town. We went to E & S Sales, which is an Amish bulk foods store. Their prices are considerably higher now than what they used to be, but many things are still a great bargain. We managed to get plenty of groceries just sticking with those bargains. Then it was out to Fork's Grocery and that is where the true bargains are. We got several items we couldn't find at E & S and other things that we needed. Finally, we visited Yoder's meat and cheese store and stocked up there as well. Lots of good eating for awhile. We visited some of the other shops in town and didn't find much which is good because, as you know, fulltimers cannot buy lots of stuff. We normally have to pitch something if we bring something in. We did manage to get downtown to an ice cream store and got a refreshing dip. It is hot and humid here, which is the same way it has been much of the summer. We are spoiled by the nice weather we had coming through the northern states, so cool and mild. Hmmmm. Tuesday we started out at the flea market and got caught in a rain shower. It really was just a light shower, and we continued to shop and walk. When it looked like it wasn't going to let up, we walked back to the motorhome and had lunch. By the time we were finished, the rain had stopped, so we went back and walked more of the market. We finished up about halfway through and saved that for today. This morning, Mom and Dad joined us. They arrived just before 9 a.m., and we went over to the market. We got several rows in when the sky turned black. It looked like we were really in for it. Terry and Dad had already started back for the motorhome and Mom and I decided to keep going. We didn't get much further because the sky opened up and it started pouring. In addition, the wind kicked up and later we heard there were 60 mph winds. I would believe it. There were awnings ripped up in the campground. . . fortunately none were ours. Mom and I found shelter in a covered rest area, although we had to crowd to the middle because the wind was blowing the rain right in on us. I'm not sure how long it lasted. . . maybe 20-25 minutes. . . but there was no let up during that time. When it did finally break, we walked back to the motorhome where Terry and Dad had gone. Dad fared pretty well, but Terry had left him with shelter and then went to the car and came back and picked him up. Terry was soaked, but Dad was pretty dry. Terry changed clothes and put everything wet in the dryer. Since we were there and it was lunch time, we ate the dinner I had put in the crockpot this morning. By the time we ate and did the dishes, the rain was once again gone, so we started out again. This time Dad stayed behind with Neal and Mom, Terry and I finished what we had started this morning. We found a few things. There are always new things to look at and it is good exercise just walking around. We are glad Mom and Dad were able to join us. It was great fun and great to see them again after a month on the road. Sunday we move back to the campground. Hopefully the repair center will have our slide parts before then and can get Phaeton Place fixed up with four slides once again. I'm tired of crawling over the bed! Our travels the last several weeks have put us in the extreme northern part of the central U.S. and we have been enjoying the cooler weather and the reduced traffic. Not as many people live in those areas and the towns are normally small and there is less traffic. You don't have to plan your turns as carefully because if you have to pull out into traffic, there will be an opening quickly. Not the case the other day as we drove down into Mt. Pleasant, Michigan, hoping to find the casino. When I did finally see the sign, we were in the extreme right hand lane and had to turn left. The only option was to drive until we could turn around. That actually didn't happen. There was heavy traffic and lane changing was nearly impossible. But no matter, as full-timers we have no set schedule or stopping point, so we continued on. Terry did some more investigating while I was at the wheel and found a mom/pop campground near Ithaca, Michigan, known as Leisure Lakes Family Campground. This camp is a jewel in the country. The county roads getting here are quite good, wide and spacious and paved. We pulled in and were greeted by the owner and his wife and daughter-in-law and visited with them as we checked in. They take Passport America for one night, but we signed up for two and later added another night. These people are really nice. They were very accommodating and allowed us to scout a little to find a site where we thought all our satellite systems would work. They have only young trees here, but we weren't sure the direction. As it was, our equipment would probably have worked from any of the sites. They have a large number of sites and a rally section. In fact, there is a Good Sam Rally going on right now. The owner was a farmer and this was his farm ground. At one point, a gravel company approached him and wanted the gravel from one area of his land. He sold them the rights to the gravel for a percentage of the loads and apparently did quite nicely. They built this campground and now he has these beautiful ponds and offers kayaking, swimming, tubing and fishing in the campground. You can also have a lakeside lot. There are some seasonals here, but they do regulate what they can set out, so it doesn't look trashy. They have individual showers which are decent and a nice camp store. We had full hookups, 50 Amp, and paid $33/night. That is a bit more than we like to pay, but a good value we thought. There are two playgrounds that I have seen, they have a new miniature golf course and pavilions for the rally folk or general use. There was a "pickin' session" most nights we were here. The owners live on site in the summer in their own travel trailer and work hard to make sure things run smoothly in the camp. If you find yourself in this area of Michigan, you should give them a try. They also sell LP in the small bottles or for the motorhomes. A r eal treat is the little goat pen. They have three goats, including Oreo and her baby, Waggles. They are SO people friendly and love to be petted. . . and fed. You can buy feed for 50 cents in the store which is reasonable well stocked. We did take a little side trip to Alma, Michigan, just about 12 miles away to get some prescriptions filled and a few miles from there in St. Louis, Michigan, was a "small" attraction. It is called the "Mini Mac" and is a small replica of the Mackinac Bridge. A very SMALL replica. Terry found it on his "oddities" add-on for Delorme. We did hunt it down. It is a foot bridge across a pond and quite cute. Today we leave and head down to Shipshewana, Indiana, for our annual pilgrimage to the flea market. We don't buy a lot, but think the exercise is worth it. And we do enjoy shopping in the town. This is a new, cheaper campground at the flea market. They actually built it in a portion of the parking lot. All full hookups and mostly pull throughs, gravel sites with grass. It is self-service, but they will take cash or a check. Info on price is available on the Shipshewana website. They do not take reservations, so if going to the flea market on Tuesday/Wednesday, plan to arrive a day or two early to get a spot. It is cheaper than the other camp in town and since this one is on the flea market grounds, you don't need a car to access that.